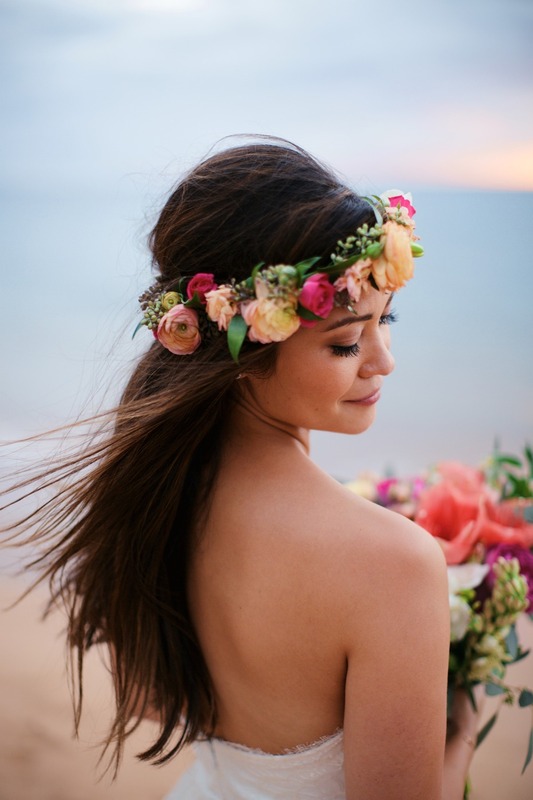 We are going cocoNUTS for this beautiful vintage boho chic Hawaiian wedding day and you really should know why! 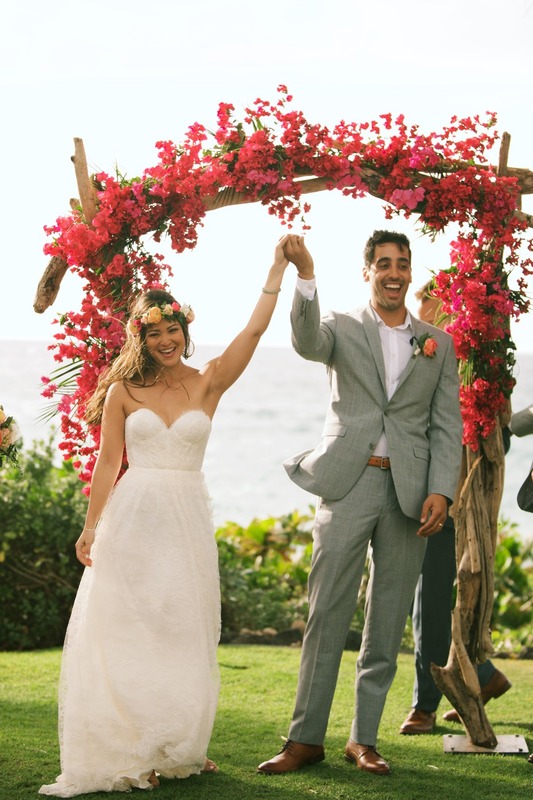 Not only did this couple meet at Coachella, but the halfway point for her family and his family just happened to be Hawaii. How perfect! 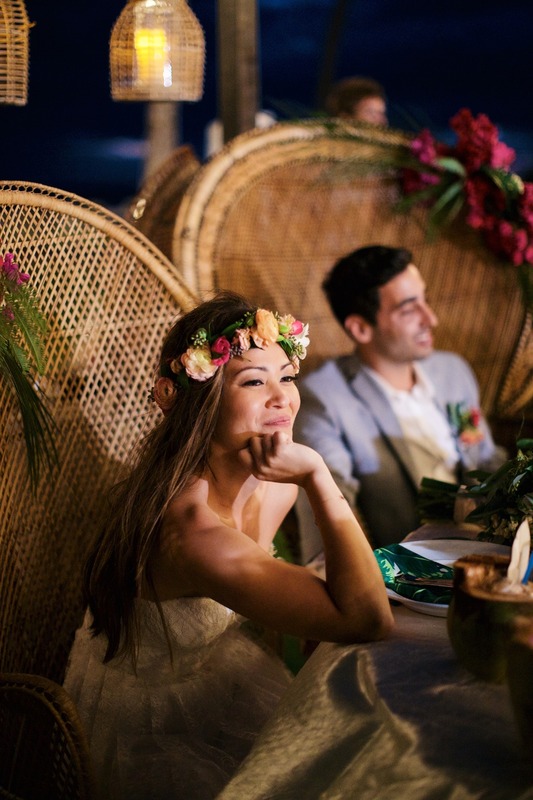 So our bride and groom took up the Hawaiian theme and truly ran with it. 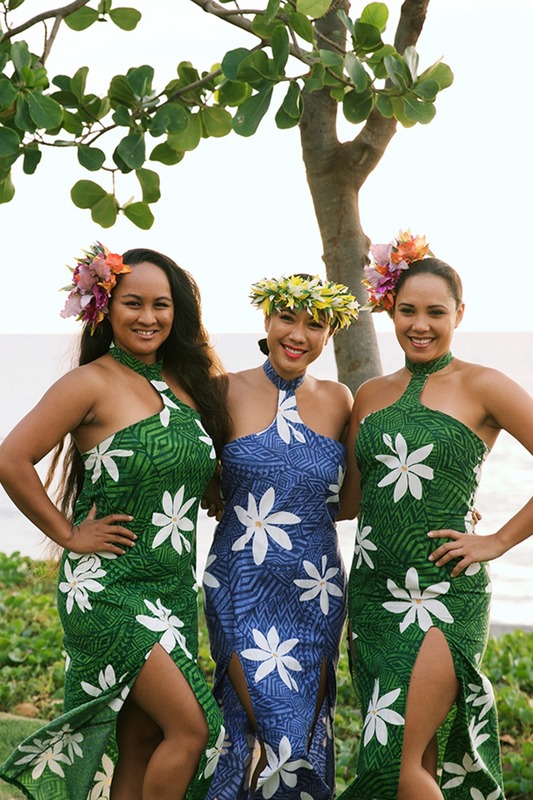 Hibiscus colored bridesmaid dresses, drinking coconuts, tropical flower and leaf inspired stationery and reception centerpieces... the list goes on. 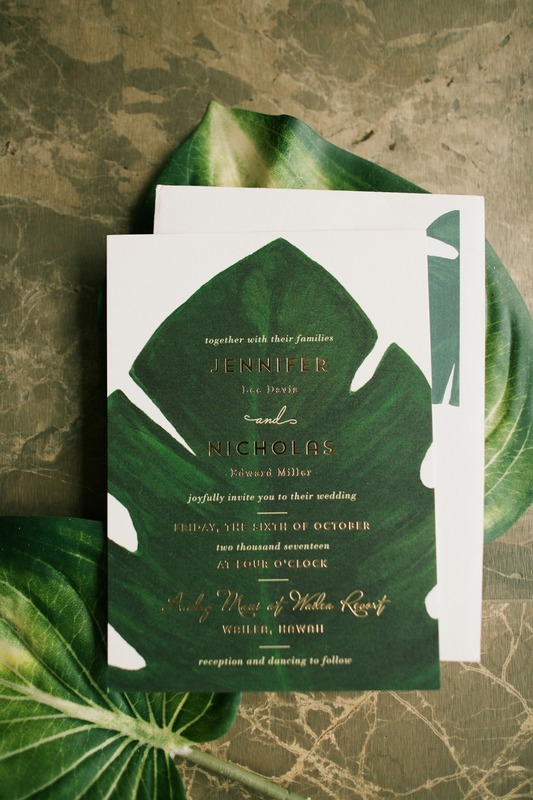 You are just going to need to keep scrolling to find your favorite design/decor element. 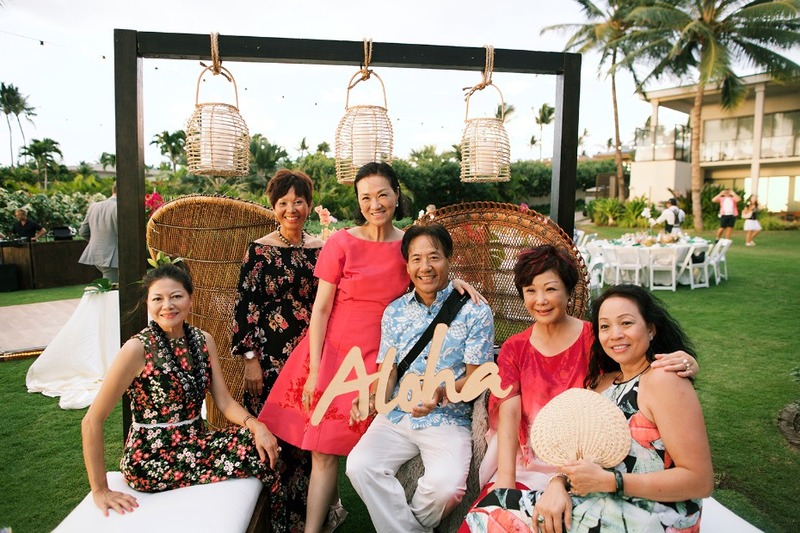 Oh and don't miss a single memorable moment, we have a full gallery chock full of photos from Anna Kim Photography. 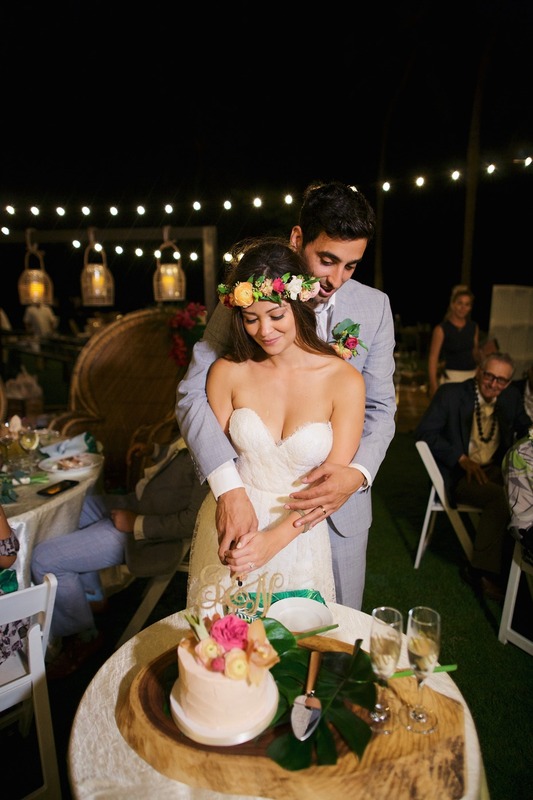 From the Bride: My dress is from Sarah Seven (Hendricks Gown), I chose it because it was simple yet elegant with a thin layer of lace. I knew it was the dress when I tried it on because it fit me perfectly and was going to be comfortable so I could spend my night focusing on having fun! 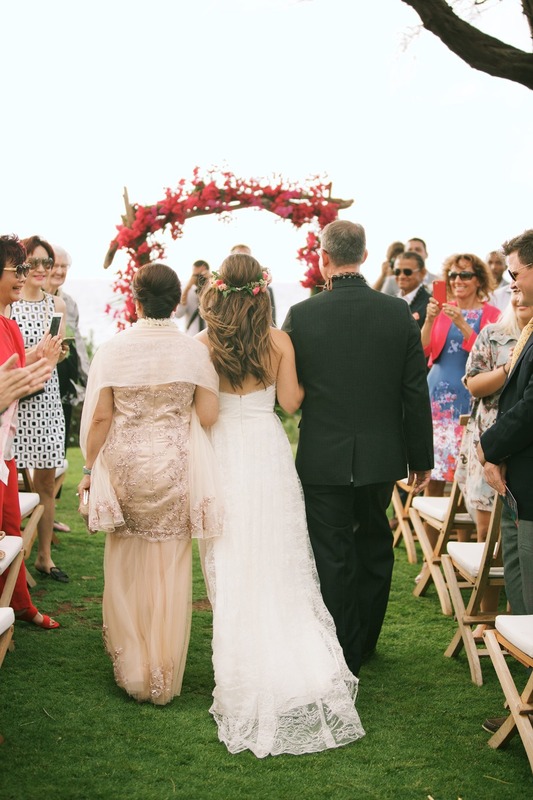 I wore a beautiful colorful Haku on my head and the simplicity of the dress was exactly what I wanted as contrast. 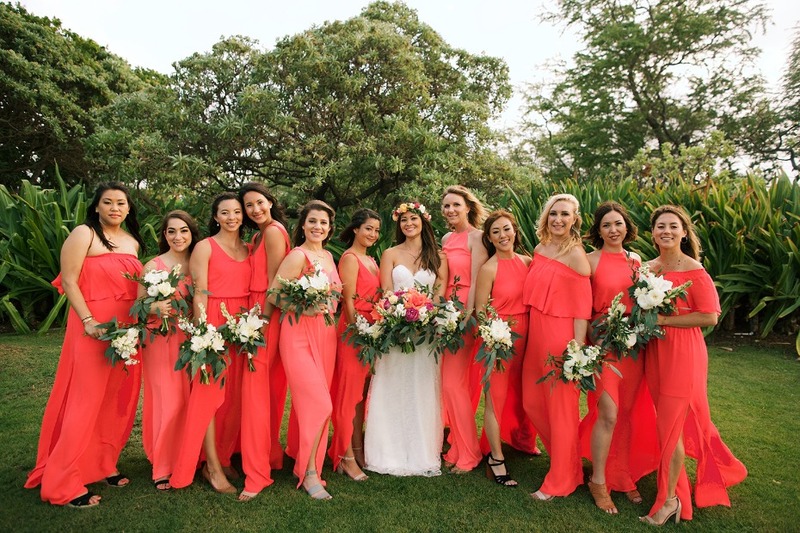 My bridesmaids wore hibiscus colored dresses from 'Show Me Your MuMu' so that they matched the colors in my flower crown and to contrast I had them hold white bouquets to match my dress. I don't wear much jewelry in general so was very simple with just my mother's jade bracelet, my bracelet Nick gave me the morning of the wedding as my gift with our wedding date engraved on it, and diamond stud earrings. 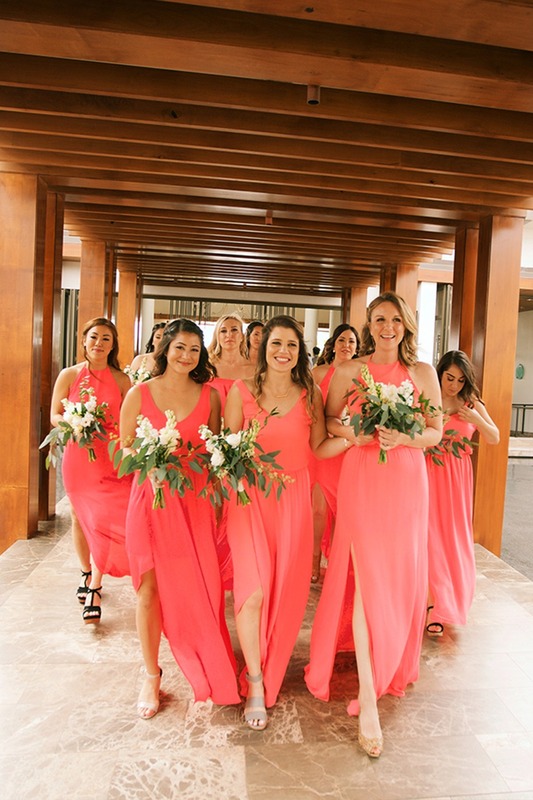 We did lose my wedding shoes while we were getting ready and had all the bridesmaids running all over the hotel grounds looking for them. They ended up being right in the middle of the conference room we were using to get ready in and we found them just in the nick of time. 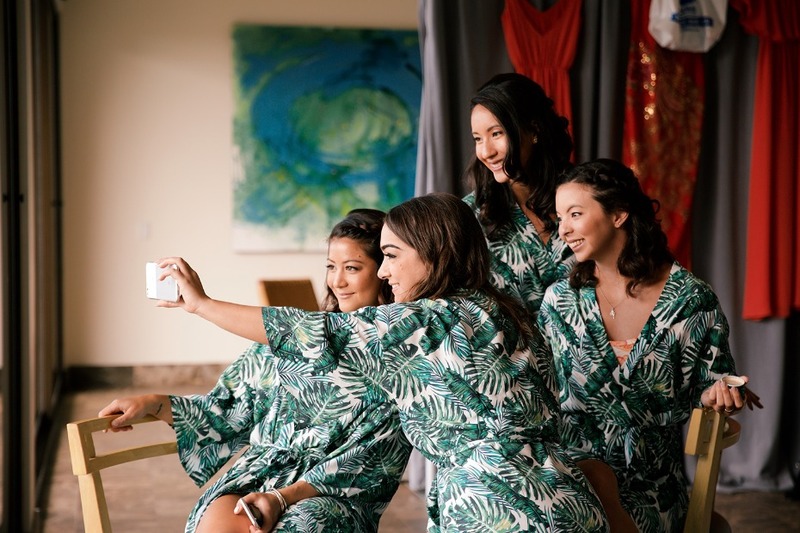 I would make sure through all the hustle and bustle that morning you lay out your shoes, jewelry and dress somewhere you can see it because with so many bridesmaids and bags etc being moved around during the day things can easily get lost or put in other spots by accident! Nick and I met at the music festival Coachella in 2012 and after a weekend of holding hands, dancing and listening to great music together realized there was a spark and the rest was history! 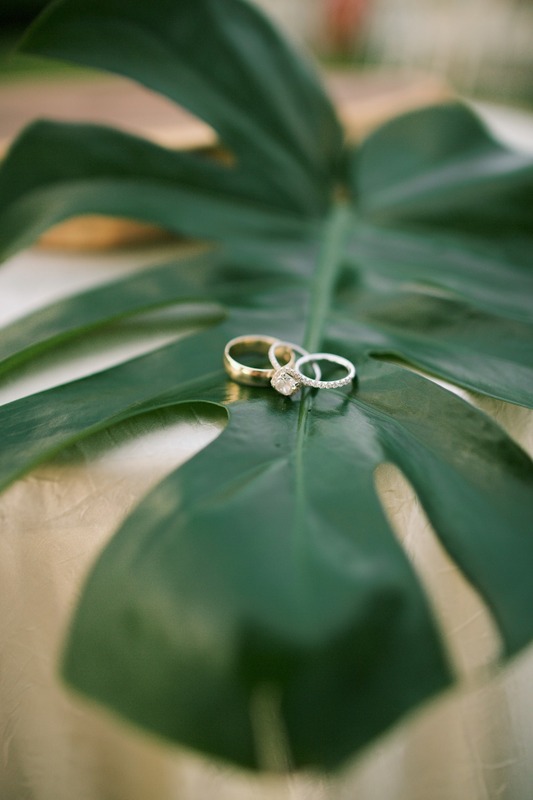 Nick proposed on our 3rd anniversary together when we were staying at a resort and had "Will You Marry Me?" as the label to a bottle of my favorite wine. 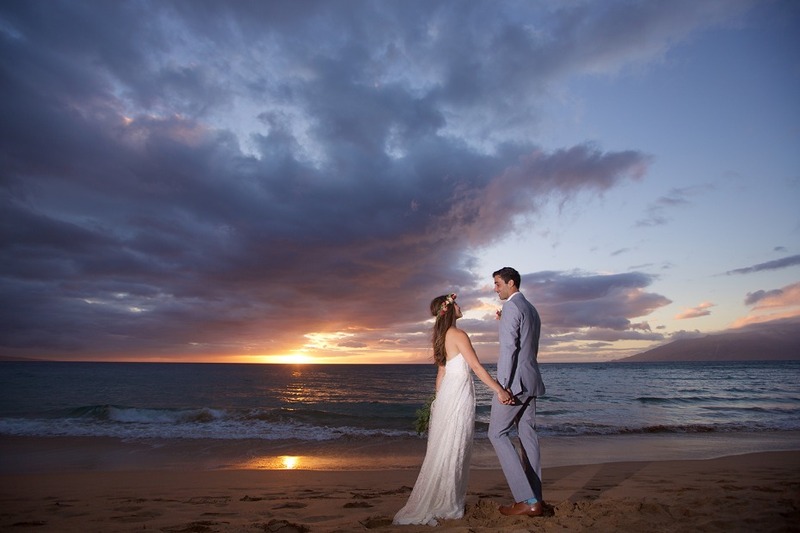 We chose Hawaii as our location for our destination wedding for several reasons: 1) My Grandparents are from Hawaii and I lived there for a few years when I was younger myself. It's my second home and holds a special place in my heart. 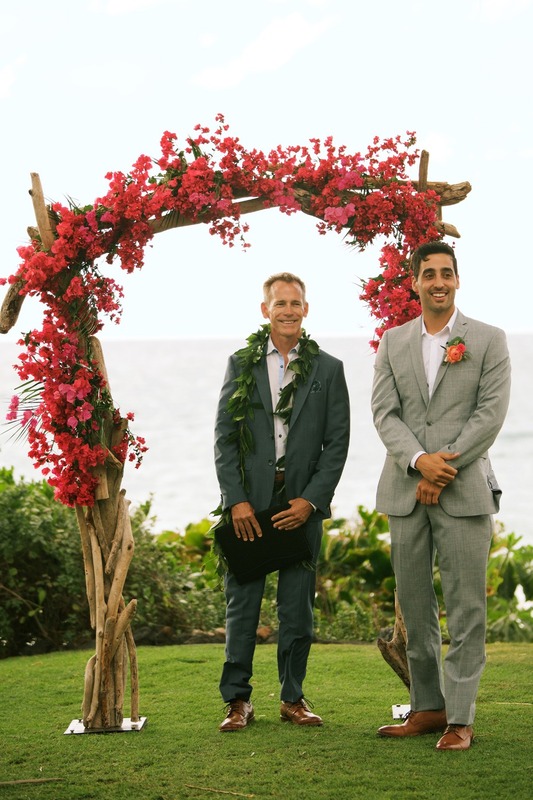 2) My parents live in Asia so Hawaii was a middle point for my family from Asia and Nick's family from California/US to travel to! 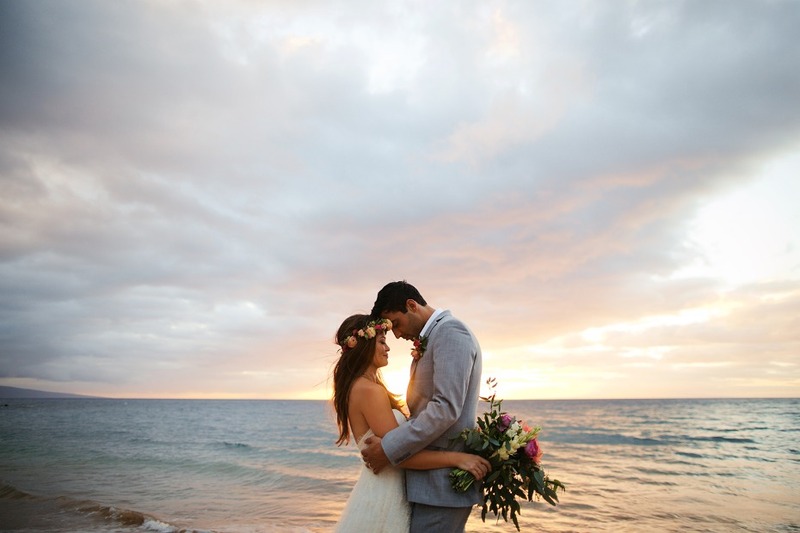 I've always wanted a beach wedding and we knew that we wanted to keep the vision and decor very natural, simplistic and tropical. 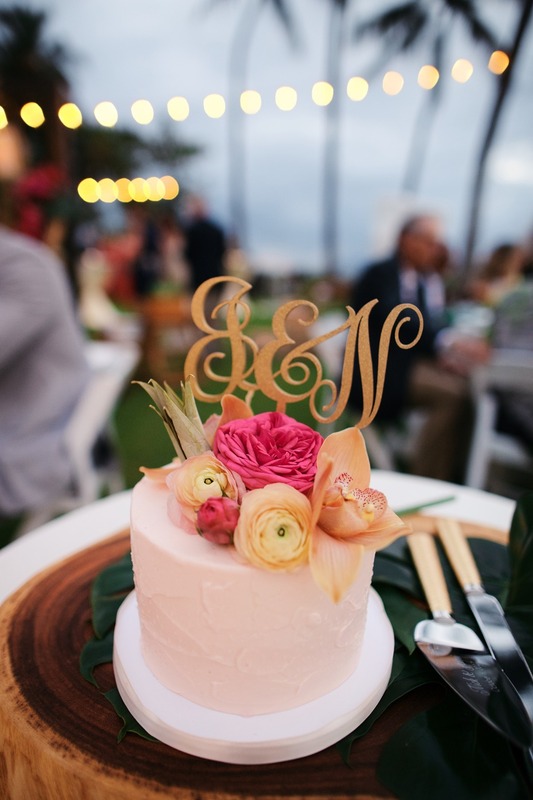 Hawaii already has such lush, gorgeous flowers and greenery so I wanted to use the natural colors from them as our palette. 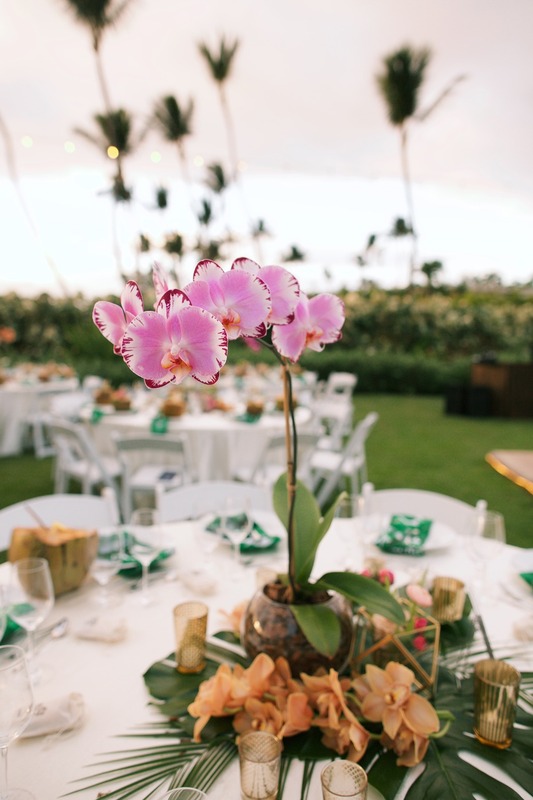 Our vision stemmed from our love of nature and wanting to keep it simplistic because the colors and decor of the Hawaiian flowers, natural wood and greenery speak for themselves. 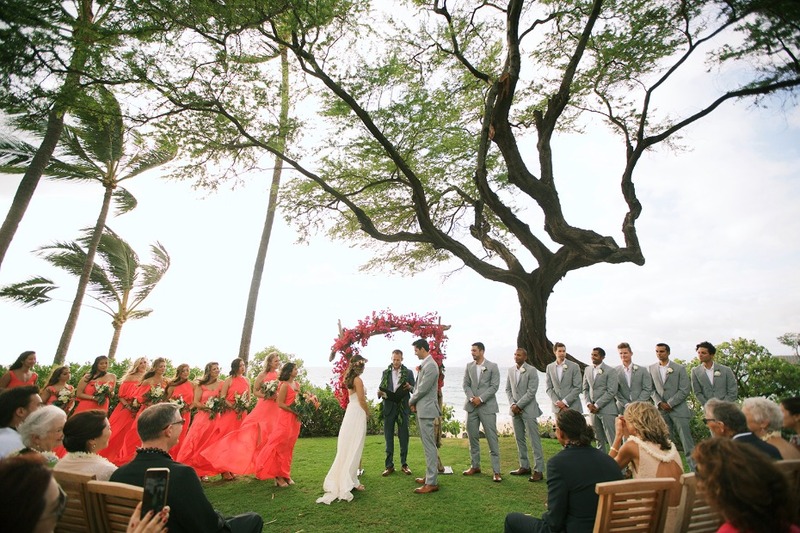 We didn't want to take away from the already stunningly gorgeous backdrop of the ocean, beach and palm trees surrounding us. 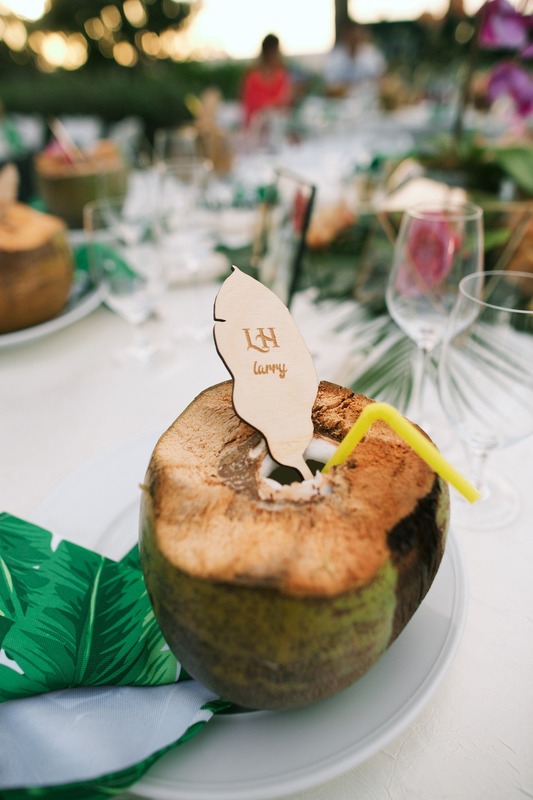 We used drinkable coconuts for our table/seating placements for guests. 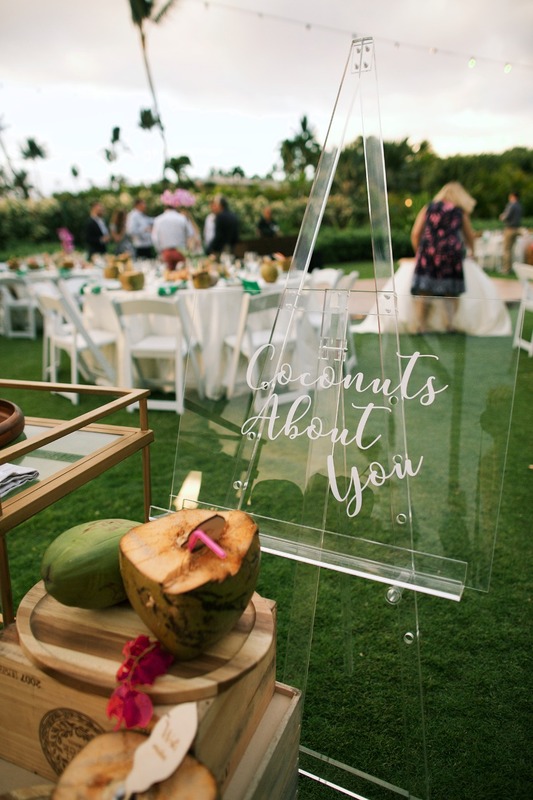 We loved this idea so much and thought it really made the whole seating process more fun for the guests. 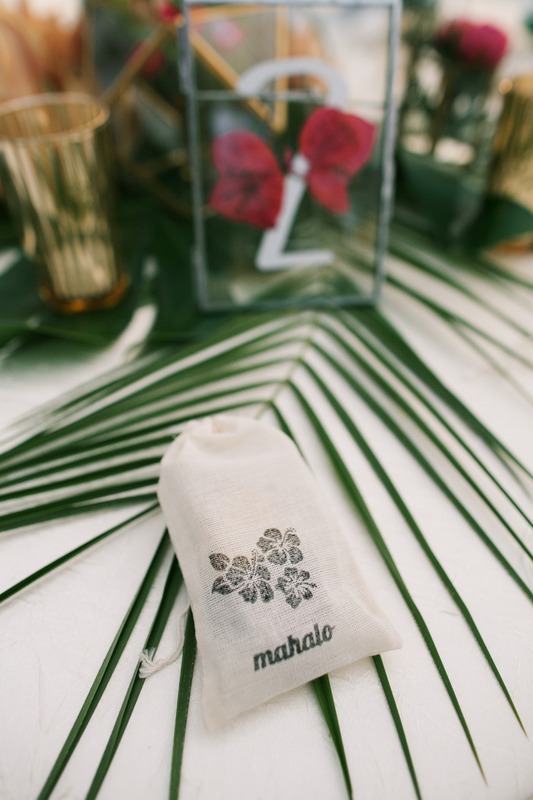 The only DIY items we did were our table gifts to guests which were Honolulu Cookie company cookies that we placed in small brown satchels with 'Mahalo' and hibiscus printed on them. 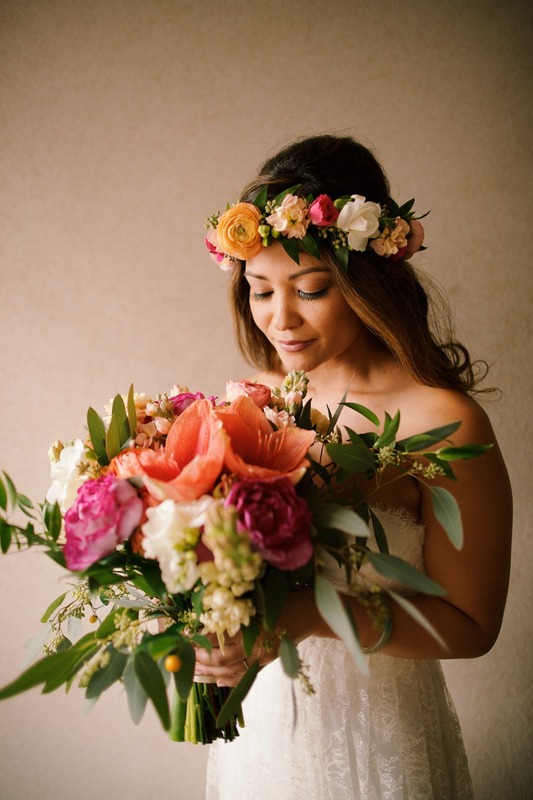 Our flower vendor 'Bella Bloom' was truly one of our main stars of the show. 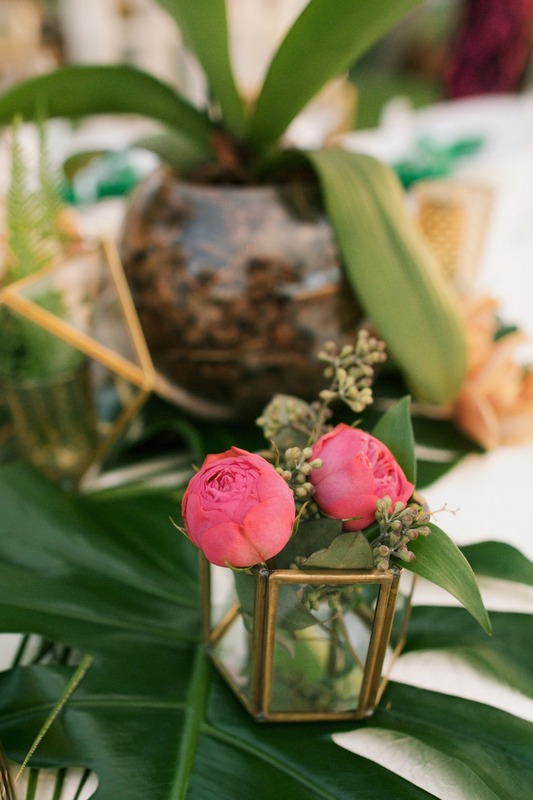 The florals they created for us were beyond gorgeous and matched perfectly with our theme. 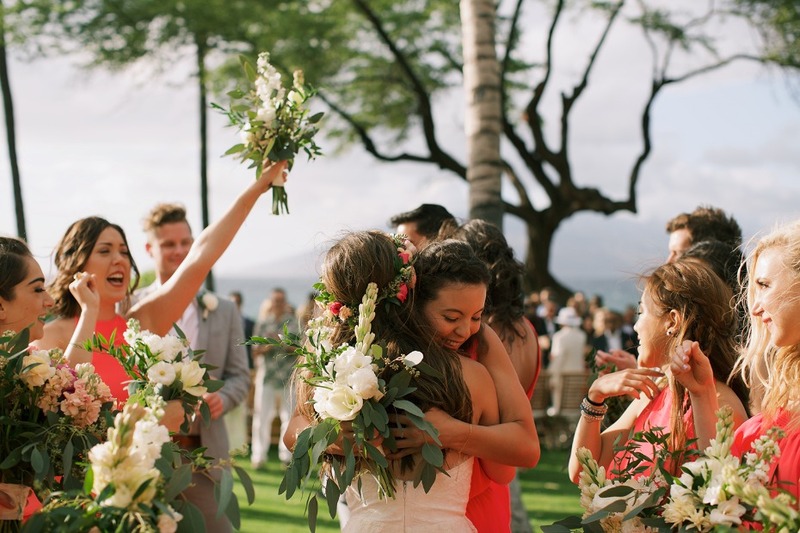 The flowers and greenery they used truly took our breath away. 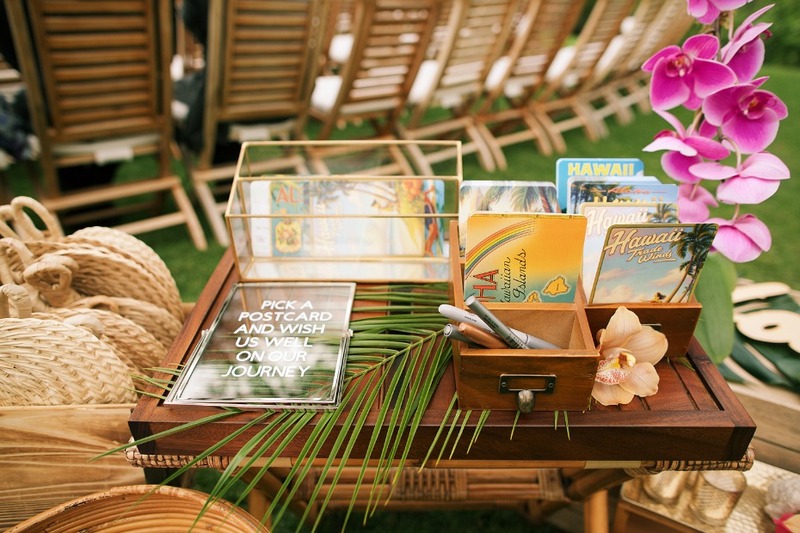 Of course, the most spectacular vendor was our wedding planners at 'Bespoke Destination Events'. Because of them, our vision was brought to life and even more magical than we had even dreamt of. 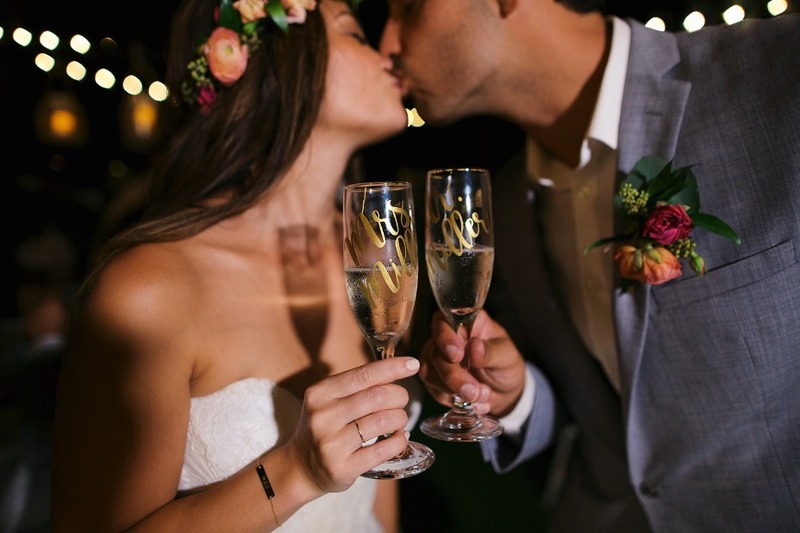 Not only did they know exactly what we wanted and brought it to fruition but they made the entire planning process stress-free, fun and easy! 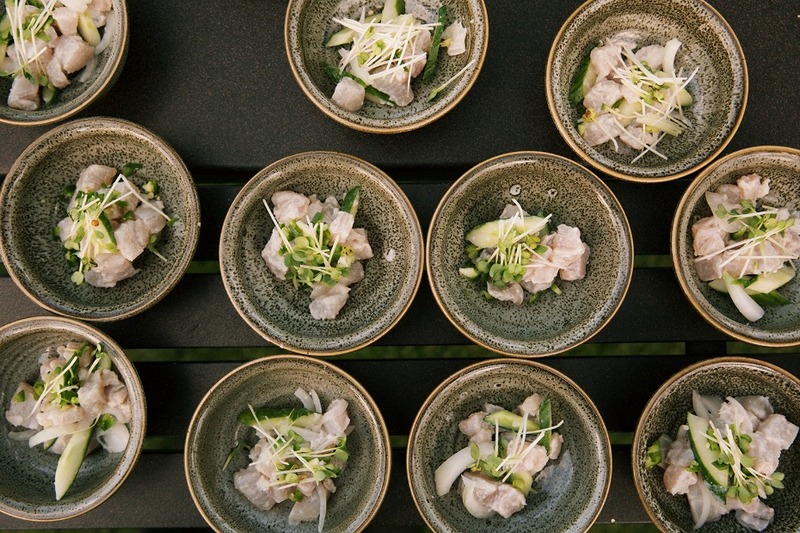 Our best advice to anyone planning their own wedding is that when you find yourself beginning to stress about the small things, step back and remember that at the end of the day people are going to be at the wedding to focus on you both and celebrating your love, not the small little bits and pieces of decor or the songs you choose. It started to rain right at the end when everyone was dancing on the dance floor but we LOVED IT. We all danced our last hour away in the rain getting soaked and it was our favorite part of the night! 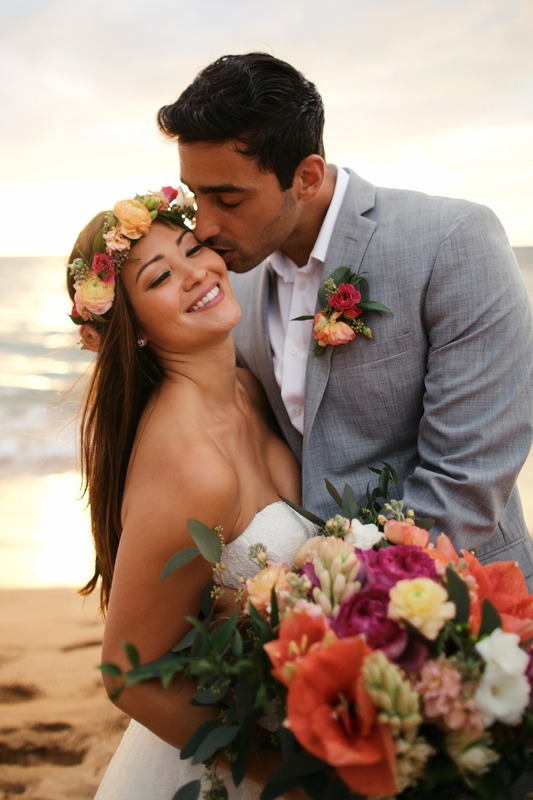 Check out the wedding film from Sunlit Films below to get a closer look at this vintage boho chic wedding in Hawaii!